Pixel Qi is a company on the quest to supply the world with displays that are as visible under direct sunlight, as they are indoors, by using transflective LCD technology, which chugs on ambient lighting outside, toning down or completely turning off the backlight. 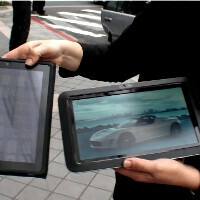 Just as promised, at the Computex 2011 expo the company demonstrated an ultrathin sunlight-visible 10" LCD, with resolution of 1280x800 pixels, making it ripe to go into an Android tablet from some brave manufacturer like Notion Ink. The display can be made even thinner, says Pixel Qi founder, by slimming or removing some of the layers, and will be available in the last quarter of this year. What's even more interesting is the roadmap of Pixel Qi - the company is planning to look into a 4.3" transflective LCD for smartphones, and bigger screen sizes, like those of conventional laptops. A hint has been given also about a 9.7" Pixel Qi display, of the size we usually associate with Apple's tablets, which has very high contrast and wider viewing angles. Some wacky concepts are on tap, too, like a bistable screen, which keeps the images even when not powered, like an e-paper, but further resources will be thrown into the idea if Pixel Qi gauges sufficient demand from manufacturers. For more information on the various screen technologies for mobile devices you can read our article here. Have a look at Pixel Qi's new slim 10-incher in the video below, compared outside to the screen of Apple's tablet. Would someone please think about putting these on an actual camera? I hate trying to take a photo with an LCD that I can't see. Which is a major reason I still want a camera with a real viewfinder, not to mention that in spite of image stabilization, they still come out better that way. Which may have something to do with the fact that any camera today with a viewfiinder is a more expensive camera to start with. If they'd put them on phones, I'd be able to do a better job with that too.